The show was incredible! We packed Lewis Carnegie FULL, and their court yard too! It was ferocious. That’s the night I met all the Austin heavies, too! Geoff Peveto, DJ Stout, Marc English, John Tullis and so many other boos folks. Thank you. So fun. And then the next night, Industry did this cool screen printing party where people could pick and choose from a handful of designs I made. Tons of people came out and got a t-shirt. So, so cool. And one of those designs, that’s the patch you are seeing here. Here’s the thing: I make this stuff, and of course, I’m always going a little too fast. 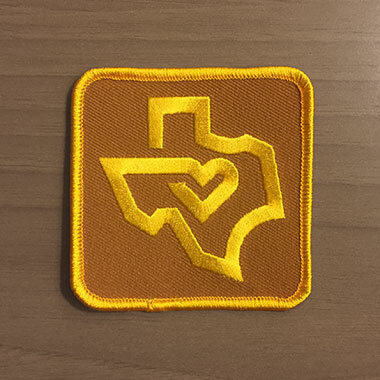 And this little Texas design I made, I remember a kid saying, “Damn, who made this? It’s awesome.” And I was standing behind him, listening and smiling. So five years later, I unearthed it and made a patch. That’s what you are seeing up above. Texas. Thick Lines. Officially messing with Texas! 03. 2.75” x 2.75” in dimension. 04. Proudly manufactured by the longhorns at Brewery Outfitters! 05. In stock forever, and, remember the Alamo! 06. Officially MESSING WITH TEXAS. 07. Inspired by the colors of high country Texas. 08. Shipped in a durable kraft StayFlat envelope.